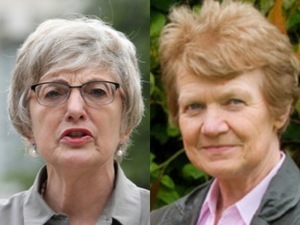 Short version: Ms Zappone needs time to deflect blame away from herself. Also , she need time to spin this so she will come out the other end looking the hero. She had a job to do. she failed , she got another 12 months. 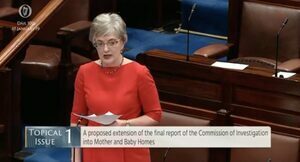 she’ll push to get the report finished in 11 months time. and will be hailed a hero , the lead having been well and truly buried by that time. 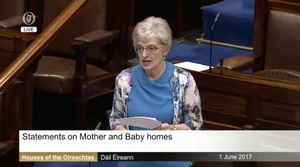 How is Katherine getting on with the separate investigation of the illegal trafficking of “adopted” babies by a certain order of nuns? Prosecutions imminent are they? At least we’ll get full disclosure as to who did what, when and for how much. With Katherine on the case, we can all rest easy. Same old tired- out pattern for victims. 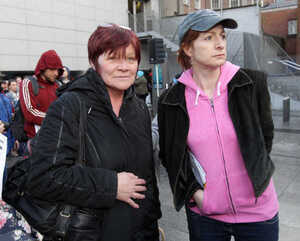 Stand outside the Dail, cold and aged and the ministers chauffeur, heated, luxurious car sweeps past them. Zero empathy as always. 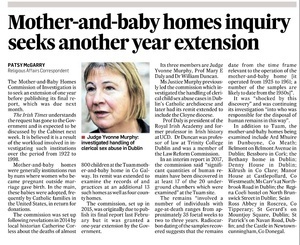 Its remarkable how any “inquiry” that is established in Ireland seems to years to play out. A cynical person might get the impression that the actual objective is to make the “problem” go away rather than getting to the bottom of the issue. Stop apologising for stating the clear and obvious truth that would be stated by anyone in any other country than Ireland without this need for crawling self-apology for stating common sense. 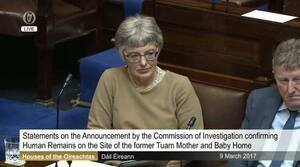 The people in Tuam should immediately organise a committe to dig the area up using professional methods and under the direction of 2 or 3 professional archaeologists and forensic investigators who actually have the balls to take their responsibility as citizens seriously. This government are utterly corrupt. As sure as night follows day if the people allow a government to leave 800 dead children’s bodies in a sewage tank while people are on social media saying ‘I think my brother might be buried there’ and ‘I think my sister might be buried there’, then you can be sure the same shafting and utter contempt wil be shown by the same political class to our own children if they can get away with it. A people who are so weak as to allow a government conduct itself in this way are going to be subjected to degradation. And who can say they will not have brought it on themselves, not having been adult enough to defend themselves and their children’s interests from such corruption?